Discussion in 'Online Games - News and Reviews' started by Kotsy, Apr 16, 2013. The roaring 20's come to life in this Online Video Slot from Novomatic! Gangsters, gambling and backroom business await. This is prohibition at it's best. Boasting of wild symbols and free spins along with a gamble feature. 5 reel, 3 row, 20 payline video slot. Dependent on coin choice, your bet size will vary. All wins pay left to right except the Cadillac Scatter. The skyline of Chicago™ is the Wild symbol and substitutes for all symbols except the Cadillac Scatter. Receive 3 or more of the Cadillac Scatter symbol and start the free spin feature. You will be awarded 12 free spins with a bottle shooting bonus. Every win will be multiplied by a random amount of up to 10x's. 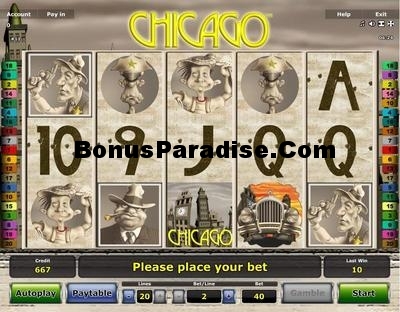 Chicago™and earn some great winnings at Stargames Slots. I really like the Chicago Slot. The Free Games are really interesting.